Our group has a custom plasma-enhanced atomic layer deposition (PE-ALD) system that is linked to an electron-beam evaporator (Evap) via an ultra-high vacuum (UHV) loadlock. Additionally, a focused (KDC 40 gridded) ion source is included in the Evap for pre-deposition cleaning or co-deposition "doping" with a low energy ion beam of N2, Ar, H2, or O2 maintained in UHV. 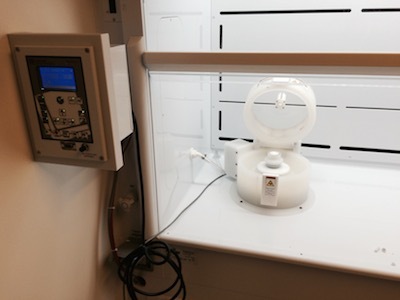 This Kurt J. Lesker-built system is housed in the SMIF cleanroom facility here at Duke and some representative pictures are included below. Our lab is in the French Family Science Center (FFSC) at Duke University's West Campus. 1) Cryogenic Probe Station (Lakeshore CRX-6.5K)--Cryogen-free closed cycle refridgerator (CCR) allows for cooling to sub-10K without monitoring or external tanks. Includes triax connections with an Agilent (Keysight Technologies) B-1500 Semiconductor Parameter Analyzer. 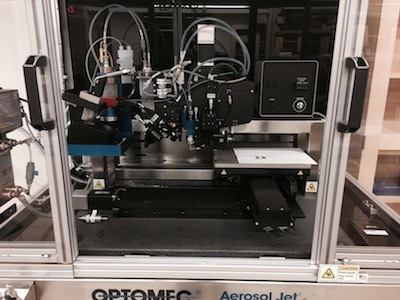 2) Aerosol Jet Printer (Optomec 300 Series)--Advancement on inkjet printing; the ink is pneumatically or ultrasonically atomized into an aerosol that is printed through a nozzle with a sheath of inert gas (like a jet) onto any substrate (e.g., plastic, paper, glass, etc.). 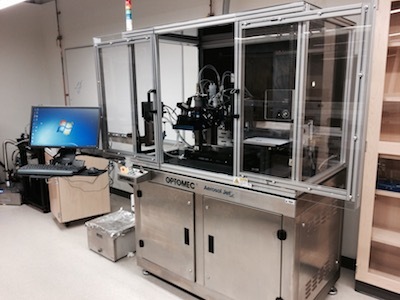 Exceptional tool for printing nanomaterial inks into thin films for electronic devices. 3) Manual Analytical Probe Station (Signatone H150W)--Tabletop probe station setup for electrical characterization of devices/circuits on rigid or flexible substrates up to 4" in diameter, including stereo-zoom microscope with digital camera. 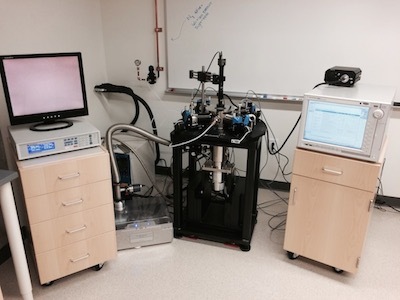 4) Ferroelectric Tester (Radiant Tech Rt66B)--System for characterization of ferroelectric materials, including polarization measurement in single-pass hysteresis loop in 5 ms with no interlacing. 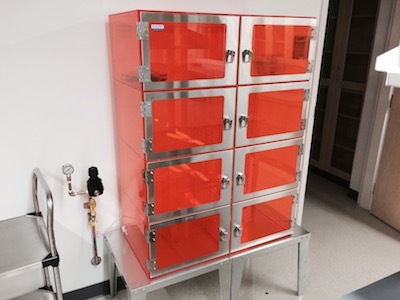 5) Nitrogen Dessicator Dry-Box--Storage of wafers, samples, and supplies in a recirculated pure nitrogen environment with UV-filtering. 6) Hood-Mounted Spin Coater (Laurel WS-650-23B)--Spinner that is mounted in one of our solvent hoods in a UV-filtered light environment for processing solution-based thin films. 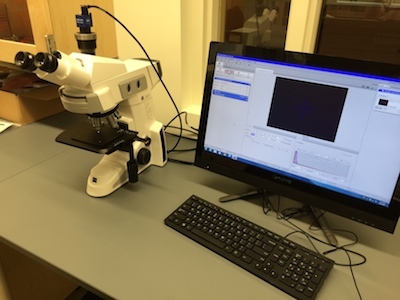 7) Compound Microscope (Zeiss Axio Lab)--Light microscope configured with 5x to 100x objective lenses and a digital camera interface to a dedicated computer for image capture and analysis. 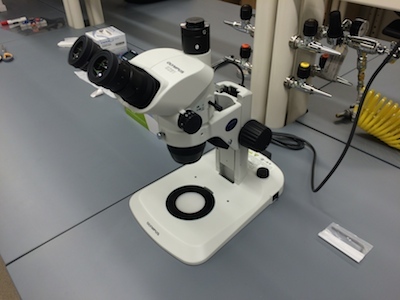 8) Stereomicroscope (Olympus SZ61)--Equipped with LED transmitted and reflected light imaging with 10x eyepieces and 45x zoom. 9) Vacuum Oven (Isotemp 281A)--Vacuum oven for curing/sintering inks printed in the aerosol jet printing system. 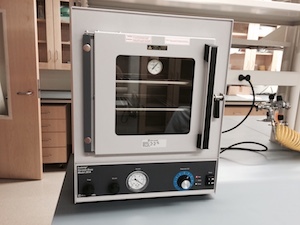 Oven can provide inert gas (N2) or low vacuum ambient conditions. Temperatures up to 280 ºC. 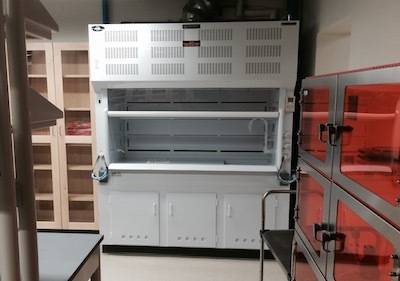 10) Fume Hoods (Nu Aire)--Three fume hoods are in the lab: 1 acid hood, 1 solvent processing hood, and 1 spinner hood (with solvent processing area).